The strawberry is an easy-to-grow fruit-bearing plant that is productive during the first two years. After two years the plant will weaken and have an increased susceptibility to disease. The Alabama Cooperative Extension recommends growing the early-bearing strawberry varieties Cardinal and Earligrow for best results. 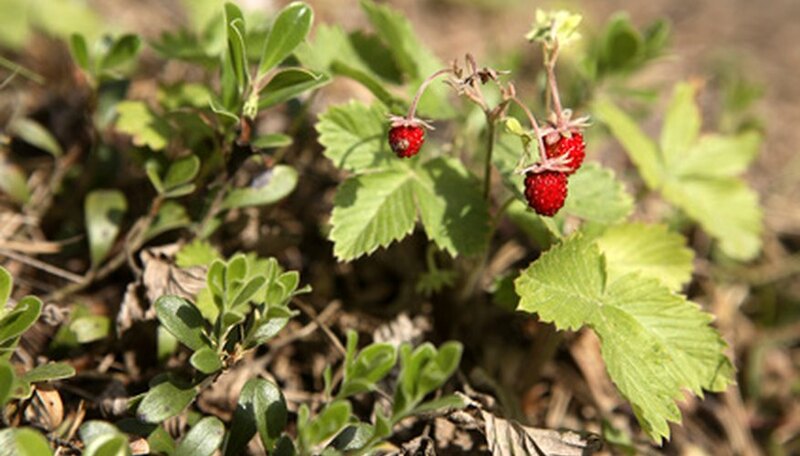 Alabama strawberry plants should be set in the ground in the months of September or October so they become established before the spring growing season. Select a planting location for the strawberries that has well-draining soil with a high organic content. Work 3 to 4 inches of organic compost into the soil with a tiller to a depth of 10 inches. Test the soil pH of the planting area to verify it is 6.0 to 6.8. Work ground rock sulfur into the soil to lower the pH number if needed. Water the soil well and let the soil rest for at least 2 weeks before planting. Apply an 8-8-8 fertilizer over the prepared planting area and work it into the soil to a depth of 6 inches. Plant the strawberry plants so their crowns are just above ground level. Space the plants 18 to 30 inches apart in rows that are 3 feet apart. Apply clean pine or wheat straw mulch around the plants to limit weed growth and retain soil moisture. Supply irrigation to the strawberry plants when the weekly rainfall is less than one inch. Remove plant blossoms in the first year of growth to promote plant runner development. This will increase the fruit production in the following years. Renovate the strawberry plants after harvest is complete. Mow off the foliage to one inch above the crown. Use caution to not damage the crowns. Narrow the rows to 12 inches with a tiller and remove plants to create a 6-inch space between plants. Place one inch of mulch around the plants and apply a 10-10-10 fertilizer.